Enjoy the old science fiction writers. knoweledge of the science of their day. 1. 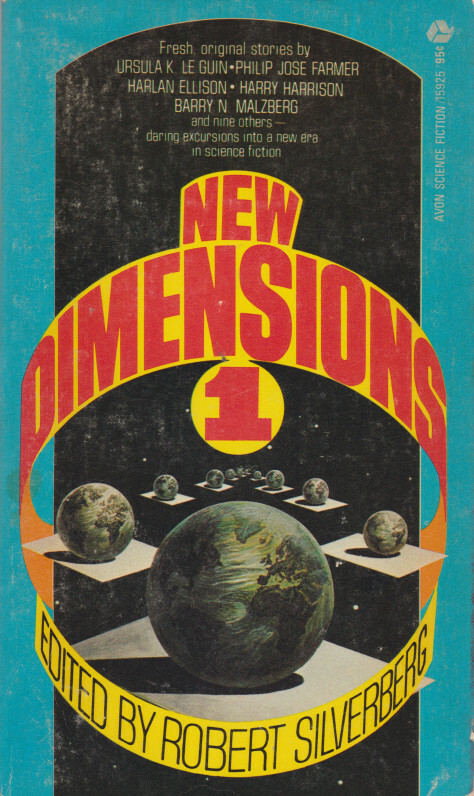 I recently read and reviewed enthusiastically New Dimensions 3, ed. Robert Silverberg (1973). Inspired, I procured quite a few more in the series… Here is number 1. Looks like an absolutely spectacular lineup — Le Guin, Ellison, Malzberg, Lafferty, etc. 2. One always needs more Clifford D. Simak, right? 3. Huge fan of George Alec Effinger’s novels and short stories. Here’s what I’ve reviewed so far…. Heroics (1979), Irrational Numbers (1976), and What Entropy Means to Me (1972). 4. Philip José Farmer, despite multiple masterpieces, churned out a lot of crud… I expect this will fall in that category. Note: The hi-res scans are of my personal copies — click to enlarge.